san:computers = _empty_array san:primaryController = "95C99FB1-80F2-5016-B9C3-BE3916E6E5DC" san:ownerEmail = "krypted@me.com" san:sanName = "krypted" san:desiredSearchPolicy:_array_index:0 = "" san:serialNumbers = _empty_array san:dsType = 0 san:ownerName = "Charles Edge" san:managePrivateNetwork = yes san:metadataNetwork = "10.0.0.0/24" san:numberOfFibreChannelPorts = 2 san:role = "CONTROLLER"
Yosemite brought Xsan 4, which included a whole new way to add clients to an Xsan. Xsan Admin is gone, as of El Capitan, but unchanged from then to macOS Sierra (other than a couple of binaries moving around). These days, instead of scanning the network using Xsan Admin. 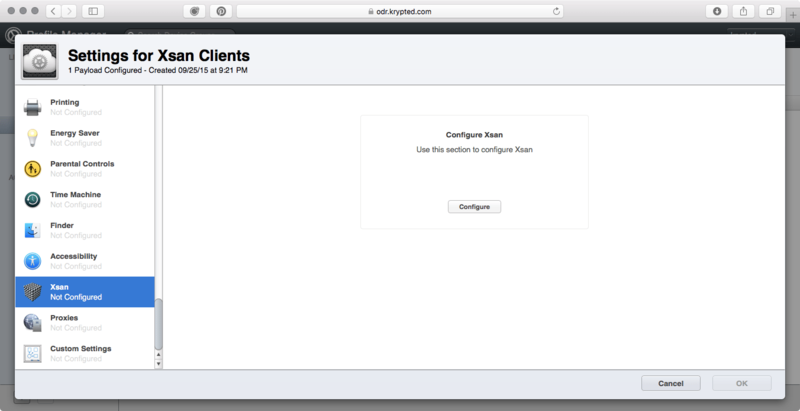 we’ll be adding clients using a Configuration Profile. This is actually a much more similar process to adding Xsan clients to a StorNext environment than it is to adding clients to Metadata Controllers running Xsan 3 and below. But instead of making a fsnameservers file, we’re plugging that information into a profile, which will do that work on the client on our behalf. To make the Xsan configuration profile, we’re going to use Profile Manager. With macOS Server 5, 5.2, and now 5.4 this trend continues. To get started, open the Profile Manager web interface and click on a device or device group (note, these are scoped to systems so cannot be used with users and user groups). 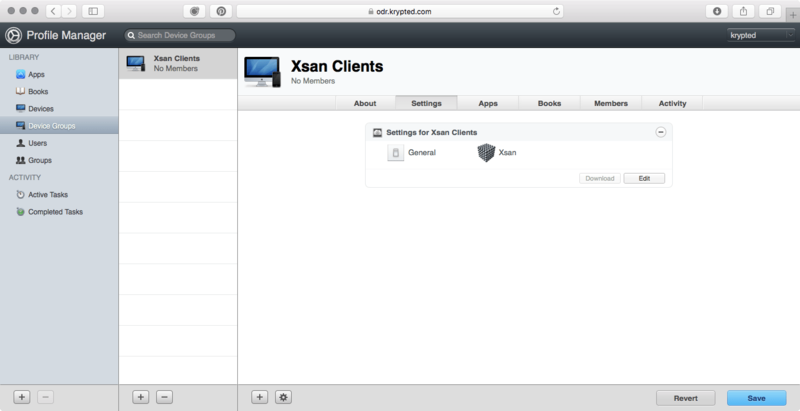 Then click on the Settings tab for the object you’re configuring Xsan for. Click Edit for the profile listed (Settings for <objectname>) and scroll down until you see the entry for Xsan. 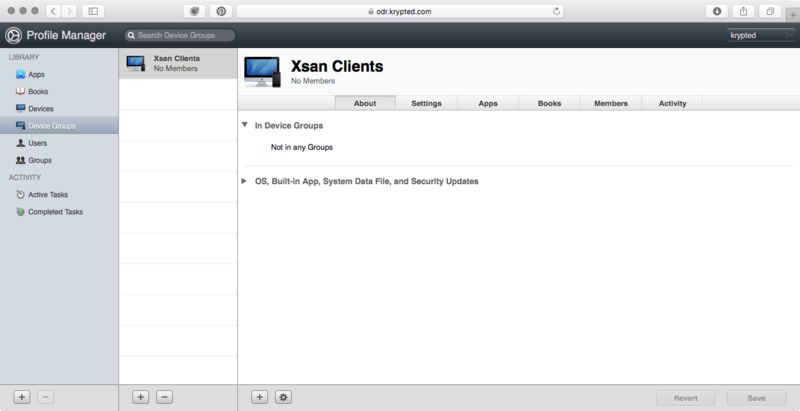 From the Xsan screen, click Configure. 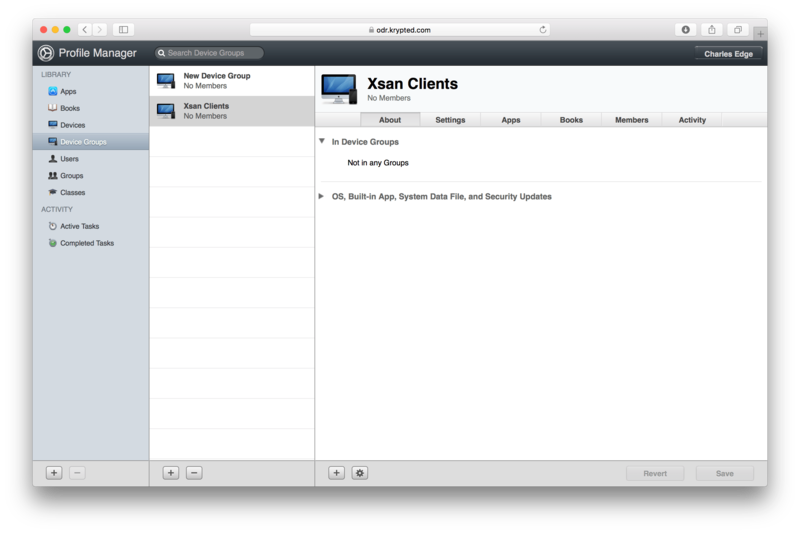 This next screen should look a little similar, in terms of the information you’ve plugged into the Xsan 4 setup screen. 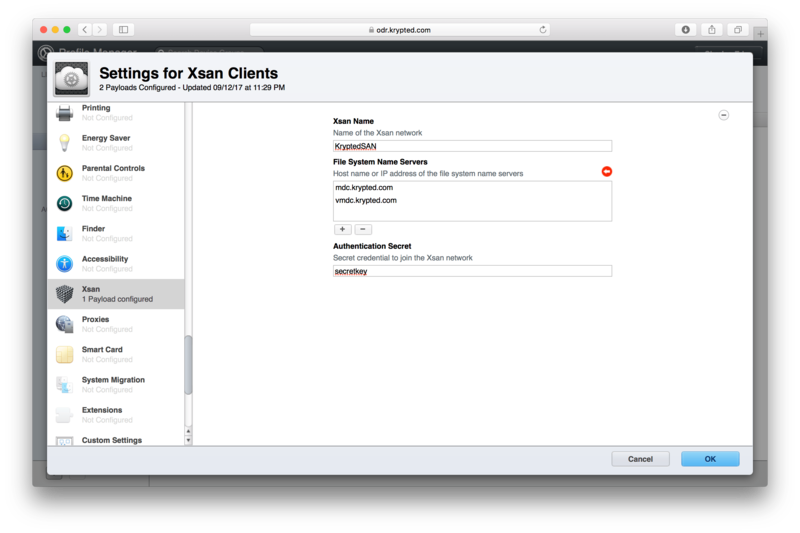 Simply enter the name of the Xsan in the Xsan Name field, the IP address or host names of your metadata controllers in the File System Name Servers field and the Authentication Secret from the Xsan screen in the Server app into the Authentication Secret field. Click OK to close the dialog. Click Save to save your changes. Then you’ll see the Download button become clickable. Choose the Mac option, and the profile will download to your ~/Downloads directory as Settings_for_<OBJECTNAME>.mobileconfig. So this was called test and will result in a name of Settings_for_test.mobileconfig. That profile will automatically attempt to install. If this is an MDC where you’re just using Profile Manager to bake a quick profile, or if you don’t actually want to install the profile yet, click Cancel. If you haven’t worked with profiles that much, note that when you click Show Profile, it will show you what is in the profile and what the profile can do. Yosemite brought Xsan 4, which included a whole new way to add clients to an Xsan. Xsan Admin is gone, as of El Capitan, but unchanged from then to macOS Sierra (other than a couple of binaries moving around). These days, instead of scanning the network using Xsan Admin. we’ll be adding clients using a Configuration Profile. This is actually a much more similar process to adding Xsan clients to a StorNext environment than it is to adding clients to Metadata Controllers running Xsan 3 and below. But instead of making a fsnameservers file, we’re plugging that information into a profile, which will do that work on the client on our behalf. 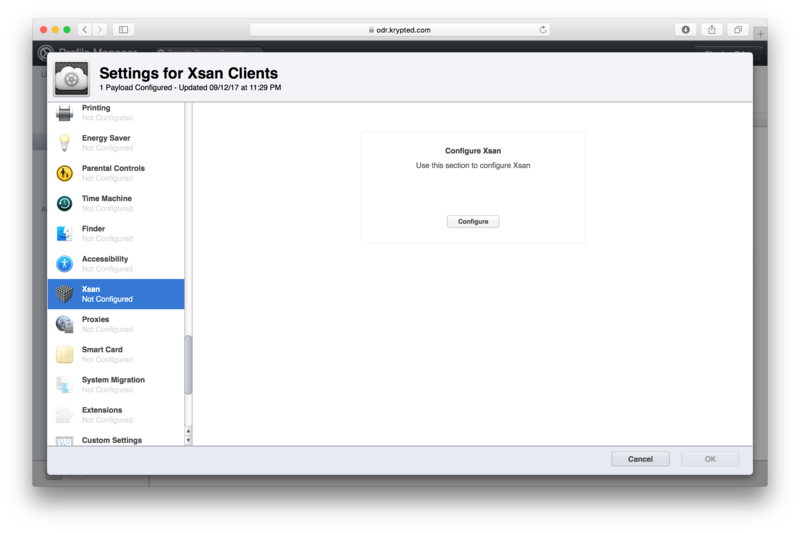 To make the Xsan configuration profile, we’re going to use Profile Manager. With OS X Server 5 and 5.2, this trend continues. Click Save to save your changes. Then you’ll see the Download button become clickable. The profile will download to your ~/Downloads directory as Settings_for_<OBJECTNAME>.mobileconfig. So this was called test and will result in a name of Settings_for_test.mobileconfig. That profile will automatically attempt to install. If this is an MDC where you’re just using Profile Manager to bake a quick profile, or if you don’t actually want to install the profile yet, click Cancel. You can use the UUID of a SAN MDC in Xsan to perform a lot of tasks. To locate the UUID of a SAN MDC in Xsan: sudo serveradmin settings san:UUID The output is just the GUID of the san client UUID. Now you know.